I have been looking forward to tonight for SO LONG. Lookit! 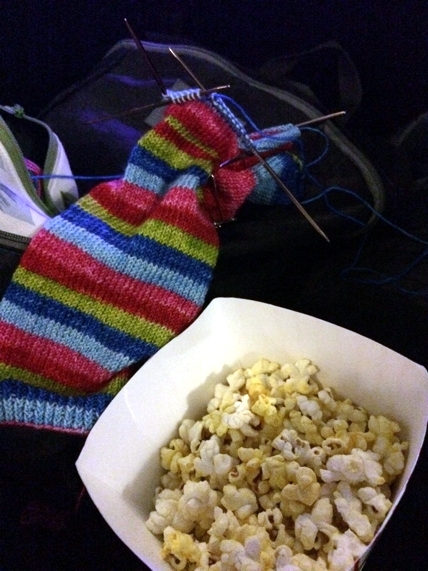 Sock and a popcorn bucket! Show knitting. Welcome to Night Vale live show knitting! Maybe you listen religiously to the Welcome to Night Vale podcast. Maybe you have no idea what I'm talking about, and it doesn't matter. You could have come out to this show and still enjoyed yourself enormously. Like Pete, who has just been nodding and smiling blankly every time I mentioned wishing I could see a live show, and who ended up loving it. Given that I spent all my hours of unpacking listening to the fictional community radio station broadcasts that make up each biweekly podcast though, I not only enjoyed myself; I was so happy to put faces (indeed, full bodies) to some of the voices. 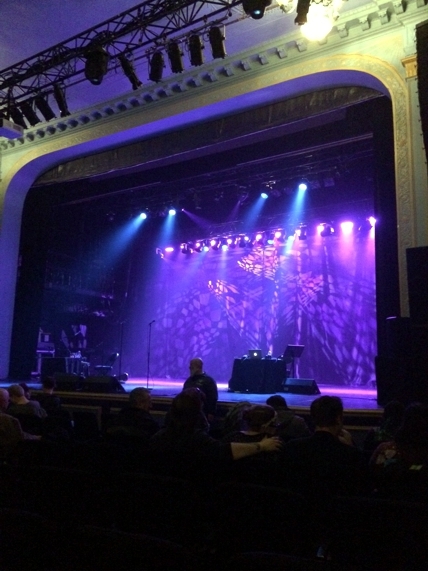 Every episode of Night Vale features a musical artist, and for the show, the artist was Eliza Rickman. Pete is pretty sure that she opened with 'Fools Rush In' (there's a sample at this link, if you click on #6 under her new release, Footnotes For The Spring). Whichever one it was, it took her about zero seconds to completely enrapture the crowd. Apparently she was recovering from a cold. I should be so lucky to have a cold that still allowed me to sound like that - she has an incredibly clear voice with an incredible range and, well, it was just wow generally. You should totally check out any of the songs at that link and see whether you love her music too. Have you been anywhere out of the ordinary lately?